I am certain most of you may be like me that do not have couscous as a staple food at home the way we have rice, pasta or noodles. My initial experience with couscous put me off making it and thinking back now, the quantity of water i used made it a soggy ‘unyummy’ experience. I have lately been creating and trying some couscous recipes especially as a quick-fix meal, because it is quite fast to make, just like noodles and my children enjoy it. Couscous comes in tiny granules and is made from the durum wheat which is also used in making pasta. It is however steamed first and then dried, thereby giving it that light and fluffy texture. Coming in precooked packets, you just pour boiling water on it and allow it to soak the liquid and your food is ready. Just like rice, spaghetti or macaroni, which it is an alternative to, it is too bland to be eaten alone, so you have to make an accompanying stew, sauce, gravy or stock to give it a good taste. I was preparing chicken to make coconut curry that would go with the couscous and midway changed my mind to this simple and delicious meal. The carrot adds colour to the couscous too and makes it a very easy combo meal for the kids. Marinate the chicken breast with the onions, ginger and seasonings and leave for at least 30 minutes. Meanwhile, put your couscous in a deep bowl. Put a pot on fire and add the oil. Put the chicken and pan-fry to brown a bit inorder to lock in the taste of the seasoning. Once browned, add the water and carrots, adjust your seasoning and allow to cook till chicken is done. Ensure you have enough stock and add more water because you need that watery stock. Also, the stock should be tasty enough to ensure it infuses well with the couscous. Once the chicken is done, pour the boiling stock into the couscous and add the butter if you want.. Pour just enough to cover the top of the couscous and cover for about 5 minutes or according to your couscous packet instructions. The stock will definitely penetrate to the bottom if it is as watery as i mentioned, otherwise you may end up with uncooked couscous at the bottom. 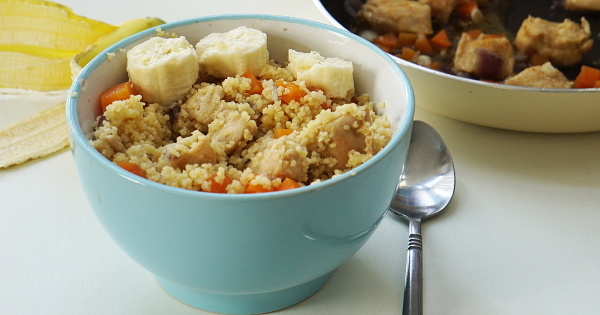 Fluff up the couscous, add the carrots and chicken, mix and serve.